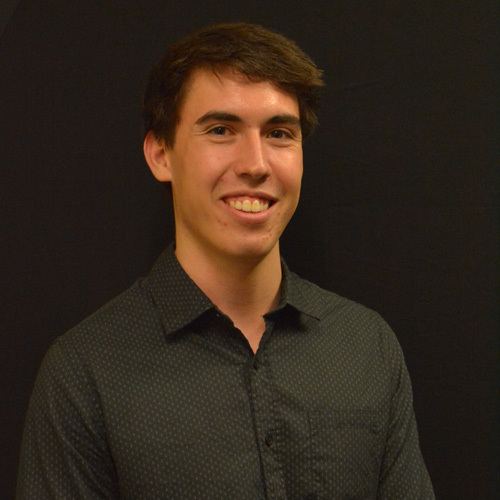 Congratulations to Erindale College DUX 2014 Jordan Smith who attained an Australian Tertiary Admissions Rank (ATAR) of 99.85 and this achievement placed him among the TOP TEN students (not top 10% but top 10 people) in the ACT; again from both public and private colleges. 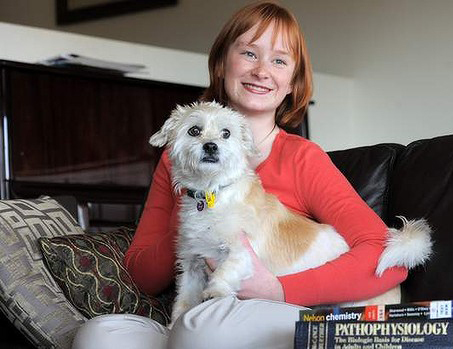 The Australian Student Prize is awarded to all students in the TOP TEN in each state and territory. Along with it comes a $1000 prize and a certificate, and 500 Australian students are awarded it each year. Jordan is now attending ANU studying Engineering Honours. The award for study at the Australian National University was established by Canberra-born multimillionaire global commodities trader Graham Tuckwell and his wife Louise. The Youth Coalition of the ACT and the ACT Minister for Children and Young People, Mick Gentleman, announced the 2014 Young Canberra Citizen of the Year Awards and YOGIE Awards on Friday 5th December in Civic Square. The annual Young Canberra Citizen of the Year Awards and YOGIE Awards (YOGIES) have been combined to shine a brighter light on young people and those who provide services to young people. The Youth Coalition is really excited to be working in partnership with the Minister and the great team from the Community Services Directorate to bring a combined Young Canberra Citizen of the Year and YOGIES Awards Ceremony. You might know the YOGIES is an annual end of year celebration, and the awards celebrate and recognise the innovative and outstanding workers, programs, services and partnerships that highlight the integral role the youth sector plays in the Canberra community. These awards shine a light on inspirational groups and individual young people who are driving positive change and shaping our community, not only for the future but here and now. Zoe Winters, Manager of the Erindale College Mindyigari Centre, was nominated for the Outstanding Contribution to Young People Award, and today she was announced the winner. Above she is pictured receiving her award from Minister Mick Gentleman. Unfortunately for us, Zoe is leaving to pursue her dreams to live and work in London. However, she receives a fabulous send-off from all her friends in the Erindale College and wider Canberra community. On Wednesday October 29th the annual Erindale Bolt was run. This event pits the fastest (and bravest) athletes from each of the squads. This year had the largest female field ever. Well done girls. The winner of this race was Kristy Martens. Kristy is a Hockey player and is in the Individual Squad. The male race again had a large field with Angus Shaw (AFL squad) taking the title. A large crowd of students and staff was on hand to cheer their representatives on. 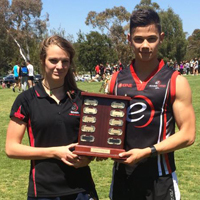 Congratulations to our school mixed touch team who won the intercollege touch competition recently. The competition has been running every Thursday this term and our school team has gone through undefeated to make it back to back titles. In what felt like a scorching hot summers day Erindale had to firstly play Dickson in the semi-final and after going down 1 nil early in the first half some stern words from Sean 'The armadillo' Connochie inspired the team to come back and win 11-1. In the final Erindale played against Lake Ginninderra and although the score line suggested a close game it was a one sided affair with Erindale taking the chips and chocolates winning 4-2. Lauren Keir (left) was selected for the Australian Schoolgirls Football side to tour Europe in Jan/Feb next year. Kristy Helmers (right) was selected in the Shadow side. Congratulations girls, great news! 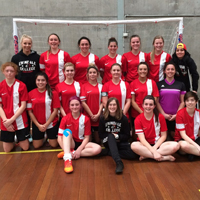 The girls Futsal sides travelled to Illawarra and played against Warilla H.S. We took two sides and both had convincing wins of the Warilla team. This past September at Perisher, Georgia Baff continued her amazing year on the snow. At the National Interschool's Competition Georgia was crowned National Champion in her signature event, Boardercross. Amazingly she also finished 2nd in the GS Race despite crashing. Well done Georgia. 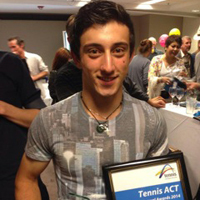 Dimitri Morogiannis recently won 2014 Junior High Performance Player of the Year at the Tennis ACT Annual Awards! On Thursday the 4th September Erindale 1 squared off against Erindale 2 in a very competitive and entertaining grand final of the intercollege OZTAG competition. After taking a 9-4 lead early in the second half Erindale 1 looked to have locked up the chips and chocolates. But in a gutsy performance and even playing a man down Erindale 2 came back but eventually losing 10-9. It was great to have both teams in the grand final and shows the depth and quality of students we have at this school. Jackson Frew recently returned from Whistler in Canada where he competed in a number of Junior Elite (16-18yrs) Mountain Biking events. These events are international events with competitors from Nth America, Japan, and Europe (Italy, Spain in particular). Congratulations to Lewis Bates, Marco Gayer, Daniel Linstead, Jono Turek, Jordan Tsekenis, Sonja Sheedy, Lauren Keir and Kristy Helmers with their participation in the ACT Schoolboys and Schoolgirls teams last week with both girls and boys teams coming 3rd in their competitions. Also big congratulations to Lauren Keir and Jordan Tsekenis on being selected for the National Schoolgirls and Schoolboys team and Kristy Helmers on being selected in the Shadow National Schoolgirls team. The Pierre de Coubertin Awards are named after the founder of the modern Olympic Games. The Awards take place on an annual basis and recognise senior secondary students who demonstrate values which are consistent with the Olympic Movement through participation in sporting activities. All secondary government and non-government schools are invited to nominate one recipient for the Pierre de Coubertin Award each year (only) from year 10, 11 or 12. Each nominee must participate actively in the school's physical education program with a consistently positive attitude. 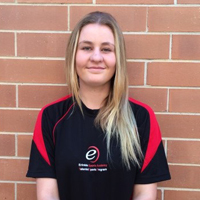 Erindale's representative was year Twelve student Josh White one of the college softball squad representatives and an Australian softball representative. Josh has also participated in athletics and basketball at college and high school level, both being Olympic sports. Josh produced a written piece titled 'Olympism in the Digital World' towards the award. Congratulations to Josh as our representative of this unique and special award. Benji Floros represented the ACT Open Men's Indoor Cricket team in Melbourne with two of his brothers Matt and Timmy and their uncle as coach. They came fourth in the competition losing to South Australia in the minor semi-final. Benji had a great tournament being the youngest there by at least two years, he was unlucky not to make the Australian under 20s team with his cousin Alexander. 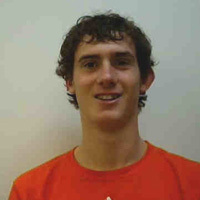 Matt Floros is a former Erindale student and has made the Australian Open men's team. Benji has a bright future ahead of him with his many talents and talented family. Evan Fowler made the Australian School boys basketball team to tour the US later in December. He with two other boys from Erindale, Jarrod Hampton and Paul Douglas-MacDonald, participated in the National Championships in Townsville last week with the ACT schools team. It's the Canberra school that's produced Raiders NRL stars Brett Finch and Jack Wighton, along with Sydney Swans AFL premiership winner Jarrad McVeigh. And Erindale College will be looking to add to its rich sporting tradition when it takes on Patrician Brothers Blacktown in the quarter-finals of the rugby league GIO Schoolboy Cup at Penrith Stadium on Tuesday. The success of Erindale's talented sports program has been on display this year, with the school's rugby league, rugby union and Australian Rules senior squads all progressing through to the play-offs in their respective competitions. Erindale sports coordinator Mark Armstrong believes the school's success is because of its emphasis on a balance between time spent in the classroom and on the sporting field. "I think the uniqueness with our program is we are really looking to balance academic success with sporting success, and our sports program allows students to combine the two," Mr Armstrong said. 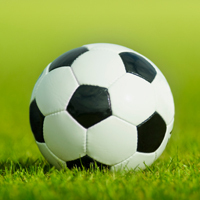 Erindale College has been able to attract expert coaching staff across a wide variety of sports since the Talented Sports Program was introduced in 1993. Matt Adams, head coach of Erindale's rugby league squad, paid tribute to principal Michael Hall for his contribution. "He is very supportive of sport, but he also draws a fine line with making sure kids are getting their work done,'' Mr Adams said. Erindale will be looking to turn the tables on Patrician Brothers after suffering a 28-0 loss when the teams met in Canberra earlier this year. The quarter-final kicks off at 1pm. Erindale College has suffered a heartbreaking 20-16 defeat at the hands of Patrician Brothers Blacktown in the GIO Schoolboys Cup quarter-finals on Tuesday 19th August 2014. Despite being down 16-0 at half-time. Erindale managed to level the scores up with 10 minutes remaining, before Patrician Brothers winger Mose Failo scored moments later to secure the victory. "I think we were very unlucky to not win" Erindale College head coach Matt Adams said. George House starred in a losing effort, with the Erindale five-eighth scoring two solo second half tries to get his side back into the game. Jordan has been successful in his application to the ANU National Scholars Program. As an ANU National Scholar he is guaranteed a place in a program of study at The Australian National University in 2015. Congratulations Jordan, ANU looks forward to welcoming you in Semester 1, 2015. Beaux-Ashley Ackland has won 1 of only 4 issued, Direct Entry into ADFA Officer Training in 2015. UPDATE: JORDAN TSEKENIS SIGNS WITH SYDNEY FC YOUTH TEAM. Jordan Tsekenis from the Senior NTC team (that moved top of the National Premier Leagues: Capital Football under-20 league table) recently returned from trying his luck with Foxtel National Youth League side Sydney FC. Striker Jordan Tsekenis spent some time with the Sky Blues as he looks to take the next step towards his dream of making it as a professional. He has since signed a contract for the 2015 season. Jordan will represent the ACT at the National Schoolboys Championships in Sydney next week before moving to his new home at Sydney FC Youth team the following week. We have 6 Year 10 students in the Netball program this year – so we decided that we would enter a team in the Southside Year 9/10 High Schools Competition. 5 of the netballers were available to play for the competition and we recruited in some of our multi-talented Year 10 girls from other Erindale sports programs. The girls played very well through the rounds and progressed through to the semi-finals. Here we played a solid Stromlo High team, and with a fantastic first half, were able to knock them out and progress through the Grand Final. With only one sub for the day, 4 out of the 5 girls being centre court players and some girls playing for the first time, it was always going to be a tough ask. However the girls played very well and only narrowly went down 13 – 9 against Melrose High. A huge thank you and congratulations to our newbies – Bridie Macdonald, Nalani Makunde and Ashlee Hesling, as well as our Netball students: Jordan Bardsley, Chance Kaihe, Felicity King, Taya Pearson and Rose Phimphravichith. I would also like to thank Laura Duffy, Selena Leao and Bec Harris who umpired on the day and Meg Sokic, Lanit Wuvuai, Kelly Maher and Tamika Aviga, who were great Erindale ambassadors for the day. The Erindale Rugby team travelled up to Sydney on Wednesday and unfortunately lost in the semi-final of the Waratah Cup against Epping Boys High. Our preparation was not ideal with a few students catching a virus on Tuesday night and unable to come in the morning and some unfortunate Sydney traffic meant that we only had 30 mins to get ready. At half time we were down 10-7 and with 20 minutes to go it was 15-14 but with 4 injuries and a couple of people having to stay on because we ran out of reserves the team ran out of legs and gave away a number of tries in the final section. It was a gutsy effort by all the boys as all the odds were stacked against them. The end score was 39-14. Our best players were openside flanker John Pouono and fullback Swayne Rateke. Calwell resident Shane Allen will be awarded bravery medals after intervening in dangerous circumstances last year. Mr Allen pulled a 13-year-old boy out of fast-moving floodwaters in a stormwater drain at Isabella Plains in Canberra's south. Shane Allen is among 78 newly-announced recipients of Australian Bravery Decorations. Governor-General Sir Peter Cosgrove has approved the awards. "I offer my warmest congratulations and express my sincere admiration for your brave actions," he said. "You now join the company of men and women whose actions have enriched our community and whose values we hold dear." In September last year, Mr Allen was cycling home after an early finish to a Year 12 class when he heard something unexpected. "I noticed that someone was screaming for their life," he said. "I just saw them and I had to help." Mr Allen said it was a struggle to catch the teenager who was being swept away in the fast-moving water. "At first I tried to grab him using my bag as a lifeline and then I had to run ahead of him," he said. Mr Allen stood waist-deep in the fast-flowing water before pulling the boy to safety, and waited with him until paramedics arrived. He said the events of the day had stayed with him. "You never sort of stop remembering it I guess," he said. "I would've done it regardless of whether it had been appreciated or not. He signed up for wrestling at 12, sick of bullying at school and thinking he would be able to protect himself by mimicking the moves of World Wrestling Entertainment superstars. Four years on, Canberra's Ben Pratt is Australia's only wrestling representative at the World Youth Olympics, in Nanjing, China. ''I was getting picked on a lot when I was younger, especially in primary school and early on in high school, and basically I didn't like getting picked on. So I took up wrestling in Year 7,'' Pratt said. ''I used to watch the WWE when I was younger and when I first signed up I thought it was going to be like that. Pratt, 16, participates in freestyle wrestling, an Olympic sport. He was dominant during the recent Oceania Championships held in American Samoa, claiming gold in the 100kg cadet division. He won the final 10-0. Pratt also plays rugby union with Uni-Norths Owls and Erindale College, the ACT Brumbies fan hoping wrestling could also help him on the way to a professional rugby career. Pratt joins an Australian team of 90 at the Youth Olympic Games, which runs from August 16 to 28, and includes athletes from 200 countries. ''I don't compete until the second-last day of competition, so I don't have to worry too much about acclimatising early,'' Pratt said. Congratulations to the Following Erindale students (L-R: Rhiannon Drysdale, Issy Turner, Tamyka Blewitt and Zoe Francis) who had their photography or artwork showcased at the Step into the Limelight Art Exhibition 2014 - Sig ns at the ANU School of Art Gallery on Tuesday 5th of August. Photography by Julian Barrett, Ailish Behan, Emily Cook, Rhiannon Drysdale, Luke Deland, Zoe Francis, Esraa Mahmoud, Connor McVey, Corinna Robinson, Angus Shaw and drawings from Issy Turner and Tamyka Blewitt. Many of you will know Grace West and the challenges she faces on a daily basis. For those who do not know Grace, she is in Year 11 and is legally blind. In my Media class, Grace takes on all challenges I throw her way and is very upfront about how I can best assist her. Last semester Grace asked if we could enter her in the Focus on Ability Short Film competition. The theme for the competition asks film makers to "Focus on the Ability" of people with a disability. Due to the availability of teacher and student actors, equipment, locations, etc.. Grace had to manage this project over (roughly) a 12 week period. If you have a chance, please take the time to vote for Grace and leave a comment if you can. Please feel free to share the link with friends and colleagues. JORDAN TSEKENIS TRIALS WITH SYDNEY FC YOUTH TEAM. Jordan Tsekenis from the Senior NTC team (that moved top of the National Premier Leagues: Capital Football under-20 league table) recently returned from trying his luck with Foxtel National Youth League side Sydney FC. Striker Jordan Tsekenis spent some time with the Sky Blues over the past fortnight as he looks to take the next step towards his dream of making it as a professional. "Initially my goal is to get a youth league contract and then hopefully get a senior contract," Tsekenis said. "Eventually one day I would like to go to Europe and play against the World's best in football, and to hopefully represent my country by playing for the Socceroos. I'm hoping to land a youth league contract and further my ambitions in the game. There will be opportunities to show what I have to offer with Youth United." Erindale took part in the college football carnival and won every game without conceding a goal all day. Great effort girls! What a fantastic team effort. We played in the rain, hail and wind. Never gave up and played some great football. Nathan Hart (above) provided Canberra's first success of the Commonwealth Games picking up bronze medals on day one, with Hart speeding his way into the record books in the process. Hart led out Shane Perkins and Matthew Glaetzer in the Australian men's sprint team in its bronze medal final against Canada before a dominant New Zealand romped to gold over England. Hart's first lap in 17.381 seconds was the fastest ever by an Australian in team sprint history, highlighting why the 21-year-old is considered a talent of the future. The former Erindale College student is reaping the rewards of a move to Adelaide earlier this year to train with Cycling Australia's high-performance unit. Hart is daring to dream about the Rio Olympics in 2016 now, although he plans to enjoy this bronze medal before getting too far ahead of himself. Congratulations to the 10 students in digital photography who have been selected to be included in the "Step into the Limelight" exhibition to be held at the School of Art Gallery. The opening is on next Tuesday the 5th August at 6pm. This year's exhibition will display more than 300 student's artworks from 30 different public schools. A Special mention to Esraa Mahmoud, whose photograph is featured on the official invitation. Isaac Dean, current Year 11 student is home after winning 1 Gold, 1 Silver and 2 Bronze medals at the 2014 World Stick-Fighting Championships in Rome. Isaac, is a junior national and world champion in the Filipino martial art of Eskrima, a very offensive weapons-based martial art in which opponents use sticks and blades to strike one another. On Thursday the 5th of June Erindale College Performing Arts students showcased a variety of top dance, drama and music performances for a public audience. The wide range of pieces performed throughout the evening showcased the extensive talent of all students involved. Sophie Buchanan, Ashton Cooke, Stacey Hellwig, Chloe Holthius, Imogen Hurda-King, David Low, Sami Prior, Courtney Radanovich, Teagan McKeauge, Melinda Weir, Kaity Harris, Millicent Norman, Romana Peckham, Naomi Eversham, Alex Foley, Nahmi Hamilton, and Haylee Matheson choreographed and performed dances ranging from tap duos, contemporary solos and Bollywood group pieces. Music pieces were performed by Kate Dennis, Chloe Agius, Shawn McCullough, Kamil Quimio, Orlando Manansala, Ben Pratt, David Low, Ben Lawton, Brin Armstrong, Madison Wallace, Curtis Malaetasi, Ash Fowlie, and Beth Hancock. These were a combination of group and solo pieces. A number of songs were student composed works. Imogen-Hurda King, Ashlee De-Silva, Chloe Agius, Brittany Earle, Marlena Law and Millicent Norman wrote, directed and performed in a range of drama monologues and group pieces. Emily Roberts, Jasmin Hamlyn and Bianca Lopez worked as ushers in front of house. Jaysson Langford worked backstage and Luke Deland was the evening's photographer. The dedicated effort put in by all students and staff involved made for a highly successful evening. Congratulations to everyone involved! submission into the Fast + Fresh 10 minute Play Festival. On Tuesday the 27th of May they performed their script with Brittany Earle at the Courtyard Studio at the Canberra Theatre. The audience enjoyed their satirical play which dealt with the concept of what it means to be a 'perfect mother'. They worked hard and were truly committed to the creation and performance of the project. 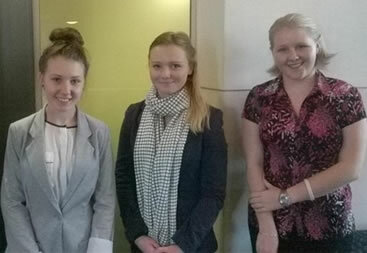 Chloe Agius, Brittany Earle and Natalie Guilfoyle recently competed in the Bond University high school mooting competition. After preparing for several weeks, these three stellar students presented arguments for a complicated law case between a teenager and a local council after the teenager became a quadriplegic through diving into a creek at a council party. Presenting to legal academics from Bond University, the girls had to prepare reasoned arguments by understanding the relevant Queensland law whilst being constantly interrupted by the judges with challenging questions. The results were recently released for the competition and Brittany Earle was presented with the prestigious Advocacy award for her tenacious approach to the judge's questioning. Well done to all the girls for an outstanding performance! 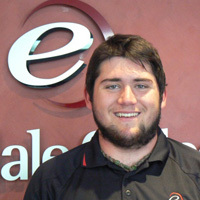 Erindale College entered two students from our Year 12 of 2013 in the Australian Vocational Student Prize. These students qualify for an award if judged suitable and if they meet graduation requirements. Successful nominees are presented their awards in the following year. Our two student entries; Christopher French and Jemma Griffiths, were both awarded an Australian Vocational Student Prize with a special certificate. However, more excitingly, Christopher has been further recognised with a Prime Minister's Award for Skills Excellence in School. This carries a further certificate and a further award. The letter advising of the awards states …"The PM's Award is granted to no more than 20 students annually since 2005. This really is a wonderful achievement for both the student and the school." The office of Senator Zed Seselja is seeking to have him and Senator Susan Ley (Assistant Minister for Education) present the PM award to Chris. The Erindale black team were involved in the inter-college finals Thursday 12th June at the Lyneham Netball centre. The girls were outstanding winning their semi-final against Lake Ginninderra College 47-17. This put them thorough to the Grand Final which we played against Dickson College. The Erindale girls were too strong and came out convincing winners 46-17. Congratulations to all the boys involved who went undefeated all day in the Stephen Larkem Shield. By winning all 4 games they have now qualified for the Waratah Cup. Riley Hughes of Yr10 was named player of the day. On the other side of that, the same group of boys had to back up and play for their club on Saturday before having the privilege of playing the curtain raiser for the Brumbies on Saturday night in the final of the Canberra 7's. Although fighting back to have a 12 all draw, officials informed us with 30 seconds to go that it is first try wins. The group tried their hardest but due to the fatigue of playing 6 games in 2 days it eventually caught up with them. On The 22nd May the boys and girls Erindale Touch Football sides competed in the ACT Colleges Touch day. Due to very high participation, Erindale entered 2 girl's teams and 2 boy's teams into the competition. Both of the girl's teams were knocked out in the pool stage but were very competitive. Both of the Boys sides made it through to the finals and faced off in the Semi-final. In a very tight game, Erindale "singlets" won 5-4. The final was played against Dickson College which Erindale won 11-1. In conjunction with Caroline Chisholm's Ignite Sports Program the Erindale Rugby TSP squad trained together in preparation for the upcoming 15 aside tournaments. Both programs will be developing a closer relationship to provide opportunities and a pathway for those students who are dedicated to sporting excellence. Congratulations to Will Callen, Swayne Rakete, Eddie Jones, John Pouono and Zac Sullivan on their selection into the Combined Secondary Colleges Rugby team. The boys represented the school and combined public college's team with pride, narrowly losing to ASC South in the final. This 3 way tournament is the main selection process for the ACT Rugby Schoolboys team. Goalball is a sport largely played by Vision Impaired Athletes. 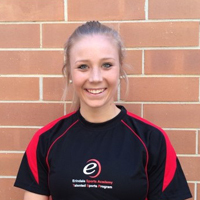 Grace West is in Year 11 and is a member of the Erindale Sports Academy. In late April Grace travelled to Sydney for a week long camp with the best Goalball players aged 12-18 from all over Australia. Each of the girls were vying for spots in the Australian team which will compete at the World Championships in the United States in 2015. The Camp involved a number of competitive games. Grace was awarded the Most Valuable Player in the Girls Category. Travis Elliott and Angus Shaw recently swam at the ACT Swimming carnival in many events. Angus qualified for the Nationals in 4 events, held later in the year, after finishing 1st in 50m butterfly, 2nd in the 50m backstroke, 2nd in 100m backstroke and 3rd in the 50m freestyle. On Thursday 8th May, 5 of our students attended a Young Women's Invitational Breakfast. The breakfast was run by the AFL at Manuka Oval and included guest speakers from Business, Sport and Politics. The aim of the event was to inspire young women to chase their dreams. The highly successful panellists including Carrie Graf, Kate Lundy and Natalie Forrest (MC) gave accounts from their life with many positive messages for the 100+ attendees. The girls who attended are all members of the Erindale Sports Academy. Pictured with Carrie Graf (Previous Olympic Basketball Coach), Lindsay (AFL Media) and Kylie (Canberra Milk) students L to R, – Kristy Martens, Ellie Toole, Maddison Catlin-Smith, Bre Tindale and Grace West. 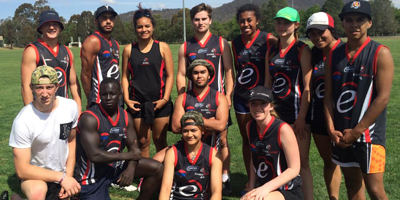 Our Erindale AFL team played in the first Round of the Giants Cup Tuesday 6th May at Kippax. The Giants Cup is NSW/ACT wide event, with Tuesday being the ACT Regional day. There were 10 schools involved on the day. Erindale played 5 shortened games including a final against Marist College. On Saturday 5th April the Erindale College Rugby 7's team travelled to Sydney to compete in the annual Scot's College 7's tournament. The boys started off strong defeating AIS Singapore 28-12. Because they won their first game they had now qualified for the cup finals which matched them up against tournament heavy weights Scots College and last year's winners the Lloyd McDermott Development Team. After two losses and a couple of injuries the boys struggled in their final game against PNG. It was a long day in the heat and they represented Erindale very well. Congratulations to all the boys who were involved and gave up their weekend to compete. The Erindale Girls AFL Team competed in the Giants cup on Wednesday the 2nd of April. We had 16 girls participate in the day which consisted of five 30 minute matches. The team had very little experience in the sport which led to a slow start but by the end of the first game things were starting to click. 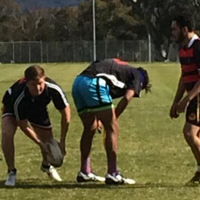 The first game was won against Gungahlin College 35 – 28. The following 2 games were both convincing victories against Mackillop (42 – 10) & Merici College (34 – 4). Erindale was then up against St Francis in the Semi Final. In a very tough and physical game, Erindale triumphed after coming down to the final few seconds (33-28). After working our way through to the Grand Final with some very impressive performances, we were met by an undefeated Lake Ginninderra side. Unfortunately, Lake Ginninderra dominated the first half leaving us almost 4 goals down at the break. The girls however, never gave up with the final score reading 40 – 23. A big congratulation to all the girls who participated! On March 13 the Erindale Cricket Team won the ACT College Final against Gungahlin. The competition was run over 4 weeks with 5 games being played against Narrabundah, Canberra College, Gungahlin and Copland. In the Final our team batted first, scoring 116 off the allocated overs. In reply Gungahlin amasses 75. Recently Ben Pratt represented Australia in 2 major Wrestling events in American Samoa. Firstly he competed in the Oceanic Championships 15-17yrs, 100kg division. He competed against local athletes, as well as wrestlers from New Zealand and Palau. Despite being one of the smaller wrestlers at 92kg, Ben won the Oceanic Title. The 2nd event was a Youth Olympic Qualifier. This involved 1 bout against an American Samoan. Ben won the bout 10-0 and has now qualified for the Youth Olympic Games in Nanjing, China in August. Congratulations Ben. 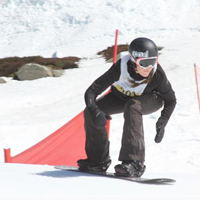 Erindale College 16-year-old Georgia Baff is aiming to follow the trails of the snowboard sensations, setting her sights on the 2018 Winter Olympics. Baff's preferred event is the snowboard cross discipline - the same one Pullin, a world champion and gold medal hope, crashed out on in Sochi. Baff grew up in Jindabyne as a skier before switching to snowboarding two years ago on the advice of her father, renowned coach Peter Baff. Peter coached both Pullin and Bright in their junior days and has helped his daughter progress on the world stage where she has competed in both Europe and the US. After a four-week trip to France and Switzerland at the end of 2012, Baff has recently returned from a month-long tour of the US and Canada. Training as part of ''Team Utah,'' she competed in six events in the space of six weeks and finished on the podium at Copper Mountain in Colorado. That booked her ticket on to the Australian team for the junior world championships in Italy in April. Baff is humble enough to know there is plenty of hard work to go if she wants to reach her goal of becoming an Olympian in 2018. Graham and Loiuse Tuckwell, and Vice-Chancellor Professor Ian Young AO, surrounded by the first Tuckwell Scholars at Parliament House. Prime Minister Tony Abbott has taken time out of his busy schedule to meet with the first 25 Tuckwell Scholars at Parliament House. After a quick photo outside his office, the 25 scholars, along with Graham and Louise Tuckwell and ANU Vice-Chancellor Professor Ian Young, were invited into the Prime Minister's suite for a chat. The Prime Minister congratulated each of the new students for their success in being awarded one of the first Tuckwell Scholarships and acknowledged the extraordinary gift from Graham and Louise in establishing scholarship program. "It was a thoughtful and philosophical discussion with the Prime Minister about this sort of philanthropic program and how it fits in with a broader story about private giving in this country," Mr Tuckwell said after the meeting. "It was quite clear that other people have followed on from our example and the Prime Minister made mention of the Twiggy Forrest gift that was inspired by this program." The Prime Minister asked the students about their study plans, how they intended to use the scholarship and their longer-term plans for the future. Scholarship recipient, ACT cycling champion and first-year medical science student Lucy Kirk, was able to compare notes with the Prime Minister about cycling, having ridden with him during one of the Pollie Pedal rides. "We knew the Prime Minister was doing Pollie Pedal so a group of us waited outside his motel and when they were ready to ride in the morning we asked if we could ride with him," she said. "I was lucky enough to ride alongside him for a while." The Tuckwell Scholarship Program was established by ANU alumnus Graham Tuckwell and his wife Louise. Their $50 million gift to the University was the largest ever donation to an Australian university by an Australian citizen. He's an emerging star in softball and AFL, but double-play doesn't do Josh McGovern's story justice - this 16-year-old has a lot more on his plate. Named the most valuable player at the national under-17 softball championships, McGovern is aiming to make the final cut to represent Australia at the world championships in Canada in June. But as soon as the softball wraps up, McGovern will trial with the under-18 NSW-ACT Rams, hoping to step up after a year playing with the Greater Western Sydney development squad. The teenager is hoping to debut in the NEAFL with the Queanbeyan Tigers this season too, but has already been selected to compete in the ACT men's softball squad that will defend their national title in Perth in March. ''I'm happy to play both, but there'll be a time, when I'm older, I'll have to pick,'' McGovern says. 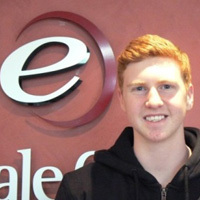 McGovern relocated from Marist College to Erindale College, which offers him the chance to develop his AFL through the school's Talented Sports Program. Actor John Wood with Erindale College Student Maddison Catlin, 15 of Gowrie who played the character of Kerrie in the movie Backyard Ashes. A low-budget Australian film championing the underdog captured the attention of Canberrans on Thursday evening, with crowds queuing to catch its local premiere. Actor John Wood was among the cast who turned out to the first Canberra screening of Backyard Ashes at Limelight Cinemas in Tuggeranong. Filmed in Wagga Wagga, it cost just $285,000 to shoot the independent comedy about backyard cricket and most of the funding came from people and businesses in the town. Wood said Australian films often struggled to get traction with audiences because most local cinemas were more interested in showing big-budget Hollywood films. But he said he hoped this film would win Canberran hearts. ''It think this film's got legs; it's very funny, it's very touching, it's got a lot going for it,'' he said. Wood said Backyard Ashes was a film in the same vein as The Castle or The Dish. ''[It's] small battlers take on the big company and win; it's a very typical Australian story about the little man against the big world,'' he said. Canberra schoolgirl Maddison Catlin made her feature film debut in Backyard Ashes as cricket-mad 12-year-old Kerri after an audition that involved a cricket match on a Sydney beach. The 15-year-old said she was too young to remember Wood as Senior Sergeant Tom Croydon in Channel Seven's popular police drama Blue Heelers, but her mother had watched the show. She spent about a month working on the shoot and said she enjoyed working with experienced actors. ''It was so much fun to be around everyone, and it didn't feel like work, it just felt like being in the backyard having fun every day,'' she said. Smith-Catlin said a group of family and friends had turned out for the premiere, but on Monday morning it would be back to school for the year. Wood will return to Canberra in a few weeks' time for the Canberra Area Theatre Awards, of which he is a patron.